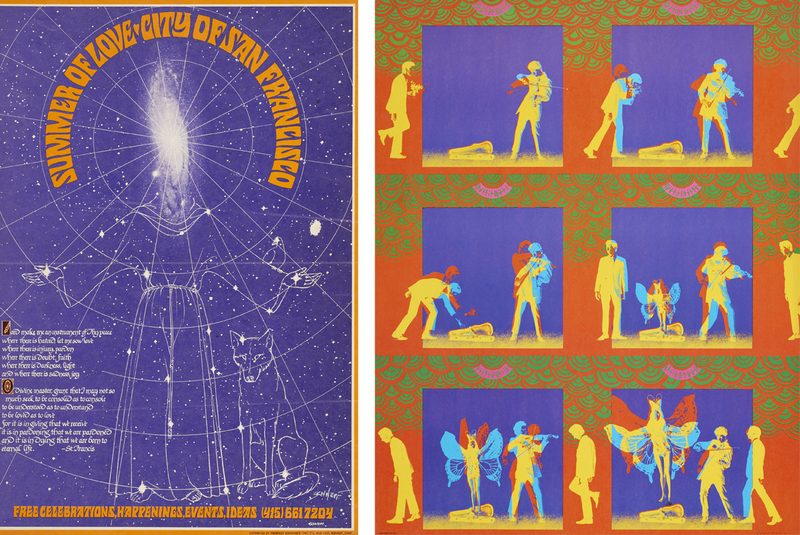 An observant reader, John Bergren, recently questioned my interpretation of Bob Schnepf’s “Summer of Love” poster, which features St. Francis. I’d like to show you an image of the poster, but I don’t have copyright permission to reproduce it here. You can see it in my book on page 119 – but only in black and white, which makes a difference, as we’ll see. There is also a copy on display right now in the de Young Museum in San Francisco; it’s reproduced here and in this article. And read on for another version. The key to the problem is that the de Young is showing a different version of the image. Theirs is of white figures on a purplish ground with a narrow orange border. The lettering announcing the Summer of Love is in orange, while the lettering of the prayer is white. With its simpler color and finer resolution, this image makes the galaxy at Francis’s head quite visible. Incidentally, I found this image in the library, too, in the very fine catalog just published for the de Young exhibit; see p. 122. If my correspondent is right – and I think he is – there is a whole new dimension to the poster. Not only does it signify peace and cheerful poverty and self-sacrifice, it makes Francis a cosmic figure. His body is a part of the cosmos; it emerges from it, rests in it, is revealed in it. In this way Schnepf’s poster parallels Nancy Earle’s more recent painting – the one on the cover of my book – in which, again, Francis’s body is melded with the cosmos, the earth and stars are visible in and through him. As a side note, the constellation is actually fairly clear in the book illustration, ironically enough. Since the illustration is printed in grayscale, we see lines and figures, but we don’t see a multicolored background. So the starry sky is more visible as a whole. On the other hand, the stars register as black. To make sure I understand this story correctly, I’d like to consult the artist and the museum curator(s). But right now, I think John Bergren is right, and I thank him for pointing it out to me. 1. Scholarship is a process. A work of research is always open to correction or alternative interpretation. 2. This correction shows why it’s important for the researcher to check the original sources and not rely entirely on secondary sources. 3. This situation is also why some grantmaking agency should give me funding so that I can travel to San Francisco and see the originals.